PT Jasa Peralatan Pelabuhan Indonesia - PT JPPI or referred to as "IPC Port Equipment" is a rapidly expanding Indonesian company that is involved in the field of port equipment services. Its business include maintenance and repair services. Headquartered in Jakarta, IPC Port Equipment is a directly-owned subsidiary company of PT Pelabuhan Indonesia II (Persero) or Indonesia Port Corporation (IPC Group), one of the largest state-owned port operator. PT Jasa Peralatan Pelabuhan Indonesia also running business in the provision of equipment components and spare parts in the work environment of IPC Group. According to IPC Group's Annual Report 2013 as cited by JobsCDC.com, PT Jasa Peralatan Pelabuhan Indonesia was formed in 2012 by IPC Group with authorized capital of Rp 100,000,000. 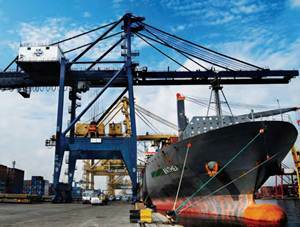 As of December 2013, PT Pelabuhan Indonesia II (Persero) owns a 99 percent stake in IPC Port Equipment with the remainder of the shares belonging to PT Multi Terminal Indonesia. Have a good understanding about the maintenance of motor, alternator, drive, panel, PLC, etc. Able to read single line and leader diagram. Able to program the PLC to ABB and Siemens. Have a good understanding in the field of oracle programming is an advantage. Placement at Padang, Palembang and Lampung. JobsCDC.com now available on android device. Download now on Google Play here. Please be aware of recruitment fraud. The entire stage of this selection process is free of charge. PT Jasa Peralatan Pelabuhan Indonesia - Recruitment Technician IPC Group March 2016 will never ask for fees or upfront payments for any purposes during the recruitment process such as transportation and accommodation.